The Borgesian effect of wandering through the archive of the avant-garde that is ubu.com was easily achieved: the entries aren’t date-stamped. The result is a simultaneity in which “new” work — that is, new uploads of work by — Yoko Ono and Marcel Duchamp suggests them as contemporaries. Yes, the date of the work’s origination is almost always present, but the date on which the material became part of ubu.com is not. Any writing about ubu.com runs the risk of proclaiming as newly presented material that’s, in fact, been lurking in the background. Case in point, the sound art of Alejandra Salinas and Aeron Bergman, much of which is archived at the ubu.com/sound/aa.html. The pair use field recordings and found sounds to dissociative ends, one highlight being a very personal piece in which Bergman transformed a cache of inherited cassette tapes into a droning requiem for a grandparent. “Bostonpopsreverbformydeadgrandpa” (MP3), with its unwieldy yet straightforward title, takes tapes left to Bergman by his music-enthusiast grandfather, who seems to have been quite a character, and adds extensive reverb — in this particular piece warping the already strings-rich Boston Pops into something gossamer, the echo a sonic symbol of his grandfather’s passing. The musician behind the dubby electronica of Fisk Industries (aka Mat Ranson) is apparently taking a year off to tour the world, and while we don’t get the proverbial T-shirt, we do get a three-track send-off, courtesy of the web-releases section of the Highpoint Lowlife label. Each song presents a dank, reverb-friendly take on digital dub, from the static-laced, wobbly grooves of “Shadow” (MP3) to the more atmospheric, minimal-techno feel of “Bubblewrap” (MP3), to the estimably downtempo skank of “Cyber” (MP3), the set’s true keeper, thanks to its acoustic touches and understated pace. Get the full set at highpointlowlife.com. More details at Fisk’s website, fisk-industries.co.uk. The audio file is only 47 seconds long, but it’s a tantalizing taste of the forthcoming second edition of the Buddha Machine, the suprise-hit sound-art gadget created by the China-based duo FM3 (aka Christiaan Virant and Zhang Jian). According to a brief posting this morning at fm3buddhamachine.com, the new Buddha Machine will come in three new colors (as reported earlier this year — disquiet.com) with nine new loops, and it will include pitch bending, which the post describes as “like a whammy bar for your buddha box.” The inclusion of pitch-blend, while not a “game changer” per se, gently nudges the object from gadget toward musical instrument. The sample audio is a mix of reverberant backing drones and what resemble lightly strummed, digitally augmented guitar (MP3), like the salvo to some 21st-century flamenco. The 47-second length likely doesn’t mark this as an excerpt; it’s probably the actual length of the loop. 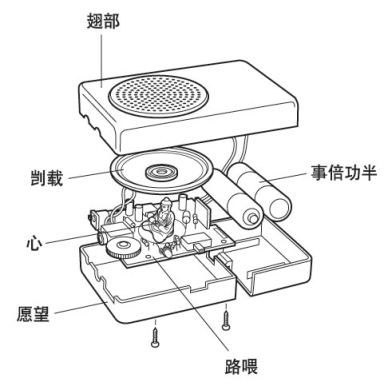 Below are exploded views of the first Buddha Machine (above) and version 2.0 (below). While the presence of the little Buddha figurine is fanciful, there is evidence of a practical physical change in the upgrade. Note that on version 2.0 there are now two little spinning wheels at the top of the machine. One is presumably a combo volume control and on/off switch, as was the case in the first Buddha Machine. The other is, I imagine, the newly announced pitch-blend tool. The new control is circled in blue. 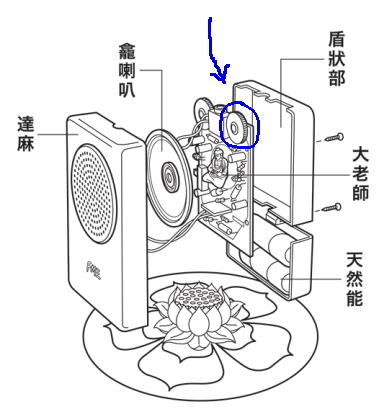 PS: Later in the day — that is, early tomorrow, October 29, dateline China — the FM3 Buddha Machine site posted a second Buddha 2.0 entry, with a photo confirming that the second wheel is, in fact, the apparatus for pitch control. Sample audio was provided of a loop being warped (MP3), and a second of the nine new loops was made available unadulterated — as with the earlier loop, it sounds very much like a richly plucked string instrument (MP3). The three new colors of Buddha Machine are burgundy, grey, and chocolate. The new packaging looks less “Pacific-rim tourism” than did the first iteration of the device, and more “refined home decoration.” Details at fm3buddhamachine.com. PPS: On October 31, over at fm3buddhamachine.com, FM3 unveiled loops 3 (MP3), 4 (MP3), and 5 (MP3). The cacophony rises quickly, from street noise (dogs panting, carts wheeled by) to a spiraling flurry of vocal exhortations, circling like some messianic ritual on overdrive. This is not a religious tradition, however. It is a sound installation, titled Å uillakku and created by Italian artist Roberto Cuoghi. Å uillakku, informed by Cuoghi’s historical and metaphysical research into the ancient origins of the Middle East, is on display from October 14 through November 23 of this year at the London museum ICA, which has admirably included a two-and-a-half-minute excerpt of the installation’s sonic element as a downloadable file on its promotional webpage (MP3). More details and information at ica.org.uk/cuoghi. According to the ICA site, the exhibit’s curator is Marcella Beccaria, and it originated at the Castello di Rivoli, Museum of Contemporary Art, Rivoli-Turin.